As has often been reported during the past twelve months, the Kiev-based aircraft manufacturer is not having an easy time at present. Bad relations with Russia have badly affected the AN-124 production and maintenance programmes as well as slowed-down discussions with potential Western investors in order to try and keep the AN-124 production line open or even design and build a new heavy-lift model. The above has so far not affected the demand by the mining and heavy equipment industry for transport on the AN-124s and the heavy sister, AN-225. Meanwhile, Ukraine has accused Moscow for having falsified airworthiness certificates of Russia registered AN-124 freighters. 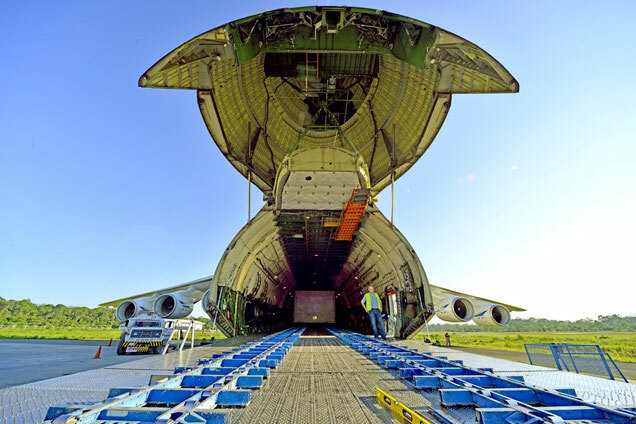 Most of the heavy-lift work is normally carried out by the Antonov AN-124 which can carry up to 150 tons at a time and offers a voluminous main deck compartment. The AN-225, which has been dubbed, ‘Mrija’ (‘Dream’) and which has a 250 ton payload supported by its six engines, is not seen as often as its smaller sister. This however has changed lately as a huge demand for the carriage of ultra-heavy and outsized mining and other equipment has shown. Antonov Airlines has just completed twelve consecutive flights with the AN-225 from Chile to Bolivia, carrying twelve giant Heat Recovery Steam Generators, each weighing 160 tons. Originally the generators were too high to fit into the AN-225 cabin and Antonov’s engineers had to design a special low-profile loading system to ensure they could be loaded. Another problem which occurred was that the weight distribution of each 160-ton piece initially exceeded the given maximum floor weight and special damping panels and reverse bend technology were conceived in order to give a proper floor-spread ratio. On top of this the flight crew of the Mrija undertook a special training course to acquaint themselves with the maximum permitted g-forces of the aircraft with a 160-ton single load for take-off, in flight and landing procedures. What a pity that only one of the originally five planned AN-225s was built. A second aircraft which was in production, was never finished. The AN-225 first took to the air in 1988 when today’s Ukraine was part of the old USSR. The aircraft design was actually modeled around the AN-124 transporter which was originally built for the Russian military and of which there are still numerous in operation mainly with Antonov Airlines and Volga-Dnepr. The dispute between Russia and the Ukraine will it seems never be solved and Antonov who hold the licenses for the AN-124 and AN-225 desperately need a solution. This can also only be of benefit for Moscow-based Volga-Dnepr Airlines who also have a thriving heavy-lift business. To add fuel to the fire, the Ukrainian police have officially opened a prosecution process against Russia’s Rosaviation and Volga-Dnepr for alleged falsifying of airworthiness certificates of “Ruslan” AN-124-100 aircraft. Russia’s Federal Air Transport Agency, Rosaviatsiya and German MRO company, AMTES are accused by the Ukraine of having had renewed the airworthiness of Volga-Dnepr Airlines AN-124 aircraft without this being supervised by license holder Antonov themselves. In how far these claims are correct, remains to be seen. However, this issue also does not help in any way for the future of the big AN transporters.